This is Ramas from the Marijampole, Lithuania Internet Cafe. This is real time blogging, I am just finishing up sending my newsletter, now I go to Poland at 2:00 PM. 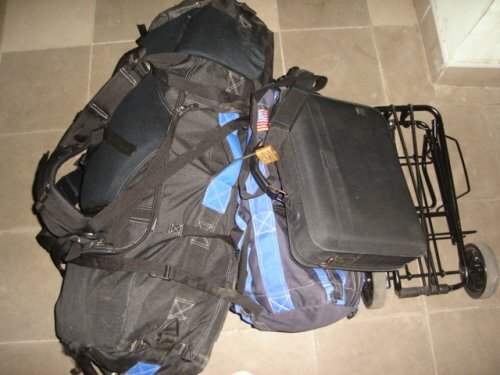 This is my bags, I have them connected with a padlock, very dangerous to leave bags sitting around in Internet Cafes. Especially here. I FEEL VERY SAFE - When I feel safe, I am extra cautions, this is when you always have problems. Waiting for the Internet Cafe to open, note I have my laptop bag out because I need it to fix some HTML in the pages I am making or the newsletter mirror page. Normally it is inside the one smaller bag. I connected the bags, ran across the street. It is very easy to buy beer here, a piece of bread is difficult. 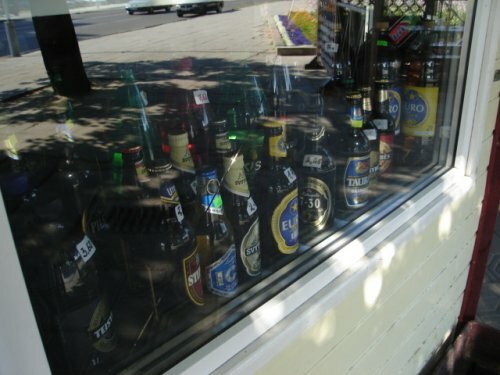 Reminds me of Florida in the USA, I am not sure, however in the past you could buy beer at Gas Stations.